The actor was presenting his movie Gully Boy with Alia Bhatt at the Berlin Film Festival, Germany. Gully Boy was screened at festival where both Ranveer and Alia could be seen sporting their looks. The fur jacket which was paired with white pants, was knitted by designer Manish Arora. The actor has also posted a video on Instagram citing details of the quirky jacket. Deepika, who has been Ranveer’s fashion police surprised everyone when she called Ranveer’s look, her one of the most favourite looks. The jacket is embellished with funky monograms. Singh captioned his look Gangsta of Love and tagged designer Manish Arora too in it. 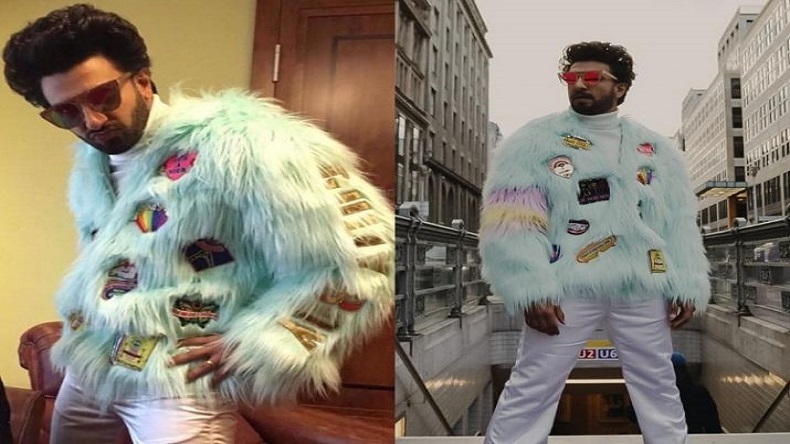 Designer Arora who had shared Ranveer’s look on his Instagram said that the look was more than fashion as it was associated with his struggling days when he was trying to establish his ground in the fashion world. In his Instagram post the designer wrote, “My dear friend @ranveersingh wearing a custom made jacket for his movie #gullyboy”.